(i) If (x + 1) is a factor of p(x) = x3+ x2+ x + 1, then p (−1) must be zero, otherwise (x + 1) is not a factor of p(x). 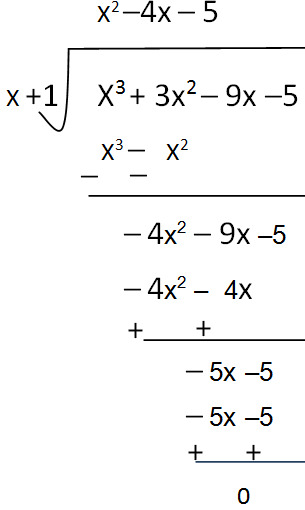 Hence, x + 1 is a factor of this polynomial. (ii) If (x + 1) is a factor of p(x) = x4+ x3+ x2+ x + 1, then p (−1) must be zero, Otherwise (x + 1) is not a factor of p(x). (iii) If (x + 1) is a factor of polynomial p(x) = x4+ 3x3+ 3x2+ x + 1, then p (−1) must be 0, otherwise (x + 1) is not a factor of this polynomial. Therefore (x+1) is not a factor of this polynomial . (i) If g(x) = x + 1 is a factor of the given polynomial p(x), then p (−1) must be zero. Hence, g(x) = x + 1 is a factor of the given polynomial. (ii) If g(x) = x + 2 is a factor of the given polynomial p(x), then p (−2) must be 0. Hence, g(x) = x + 2 is not a factor of the given polynomial. (iii) If g(x) = x − 3 is a factor of the given polynomial p(x), then P(3) must be 0. Hence, g(x) = x − 3 is a factor of the given polynomial. 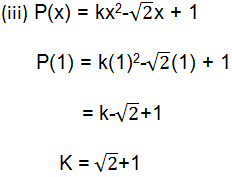 : If x − 1 is a factor of polynomial p(x), then P(1) must be 0. Such that pq = 12 × 1 = 12 and p + q = −7. (ii) 2x2+ 7x + 3 we can find two numbers such that pq = 2 × 3= 6 and p + q = 7. They are p = 6 and q = 1. (iii) 6x2+ 5x − 6 we can find two numbers such that pq = −36 and p + q = 5. They are p = 9 and q = −4. such that pq = 3 × (−4) = −12 and p + q = −1. (i) Let P(x) = x3− 2x2− x + 2 all the factor are there. These are ± 1, ± 2. Let us find the quotient on dividing x3− 2x2− x + 2 by x − 1. 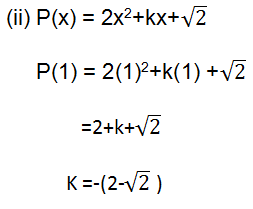 (ii) Let p(x) = x3 – 3x2−9x – 5 all the factor are there. These are ± 1, ± 2. 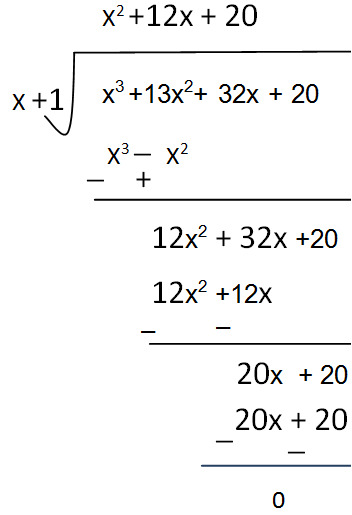 Therefore (x+1) is the factor of polynomial p(x).
. Let us find the quotient on dividing x3– 3x2−9x – 5 by x+1. 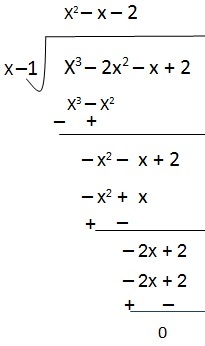 (iii) Let p(x) = x3+ 13x2+ 32x + 20 all the factor are there. These are ± 1, ± 2, ± 3, ± 4. 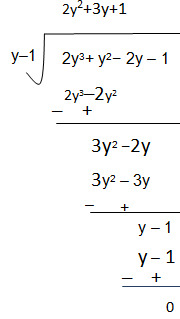 (iv) Let p(y) = 2y3+ y2− 2y – 1 all the factor are there. These are ± 1, ± 2. 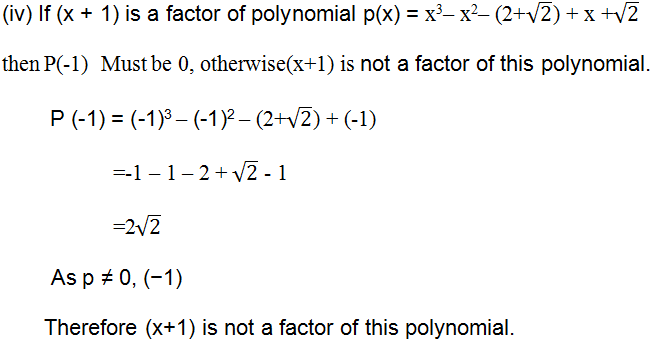 Therefore (y–1) is the factor of polynomial p(y). Let us find the quotient on dividing 2y3+ y2− 2y – 1 by y–1.